The unit has an inbuilt LCD display for indication of system status and for use when commissioning the unit. 5 LEDs indicate common system conditions. In cases where greater radio coverage is required the Translator may be used with one or more Expander Modules (EUW-EM-01). The system has a RS232 connection to a PC. The PC link allows for complex system commisioning and provides a full set of survey and diagnostic tools. 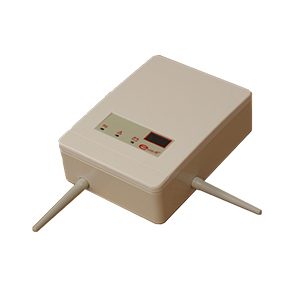 The EUW-CEM-02 is a fully Intelligent wireless to conventional Interface module.. The module allows the use of fully intelligent radio field devices alongside standard hard wired devices. Additional Information The wireless to conventional Interface is intended to be used with a fire control panel the application provides a simple way of expanding a pre-existing conventional / addressable hard-wired system with 32 addressable radio field devices including detectors,sounder / beacons, manual call points and input / output modules Design – The unit is housed in an IP68 housing making it suitable for mounting in wet environments and outdoors. – The Interface moduler is fitted with two orthogonal antennae which reduce radio fade and ensure reliable radio communication.